Mon – Fri 8:00 a.m. – 4:00 p.m. Sat 11:00 a.m. – 3:00 p.m. Welcome to our showroom! Whether you’re looking for a new installation, in-house / in-store repair, or simply just looking to buy accessories, we encourage you to come visit us so that you can receive the service you and your family deserves. Our showroom is Long Island’s only fully stocked central vacuum store offering a wide selection of accessories and parts. We stock a diverse amount of bags, belts, filters, fittings, inlets, and other supplies in order to accommodate each and every one of our customers. Our Showroom also has all of the industry’s latest innovations right on display for you to try for yourself including Hide-A-Hose, Vroom, Walle, and Spot. Whatever your reason, we want to help you. 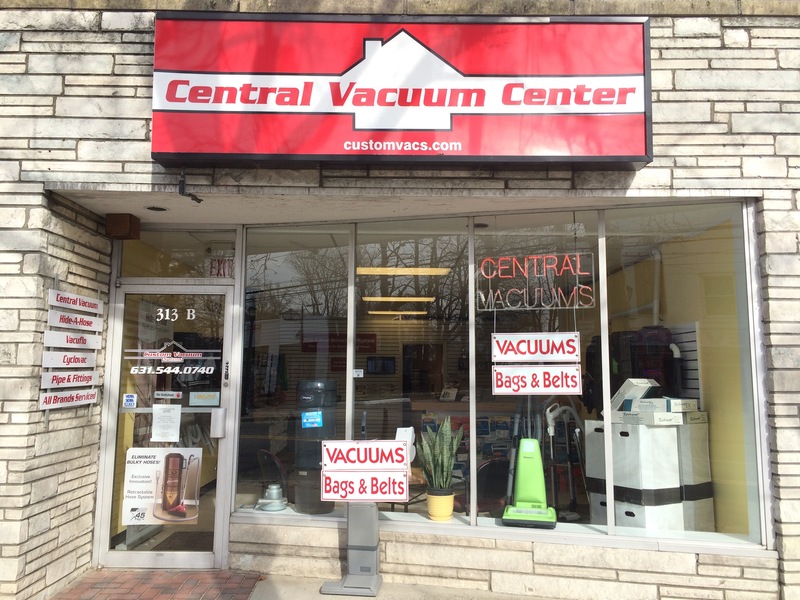 Come visit our showroom and make your central vacuum experience the best one possible. With over 50 years of experience, we are the Regional Distributor and Authorized Dealer of VACUFLO, the premier of Central Vacuums. We do not install them as a sideline; they are the only product we have been installing over the years. We care about high quality, low prices and extraordinary customer service and that is why we chose the VACUFLO line. It is by far the best on the market! VACUFLO gets rid of that “vacuum smell” that lingers after you’ve vacuumed with a portable or upright. That “smell” is the recycled air that is filled with dirt, bacteria and mold that your standard vacuum just can’t clean out. That dirty air goes back into your home, nose, throat and lungs! Central Vacuums get rid of the dirt, bacteria and mold and eliminate the odors the first time you vacuum. Central Vacuums whisk away the dirt through a network of in-wall tubing and deposit it in a canister located away from your living areas. Your home is a cleaner and a much healthier place to be – the way it should be! Our hope here at Custom Vacuum Systems is to be the best in our field and to keep our customers happy and clean. So when you decide to get a home Central Vacuum System, remember VACUFLO and us, Custom Vacuum Systems. We’ll provide you with the best in Central Vacuum System Installations, Central Vacuum Supplies, Attachments, Accessories and so much more! Thank you for your interest in Custom Vacuum Systems. We look forward to serving you now and in the future!